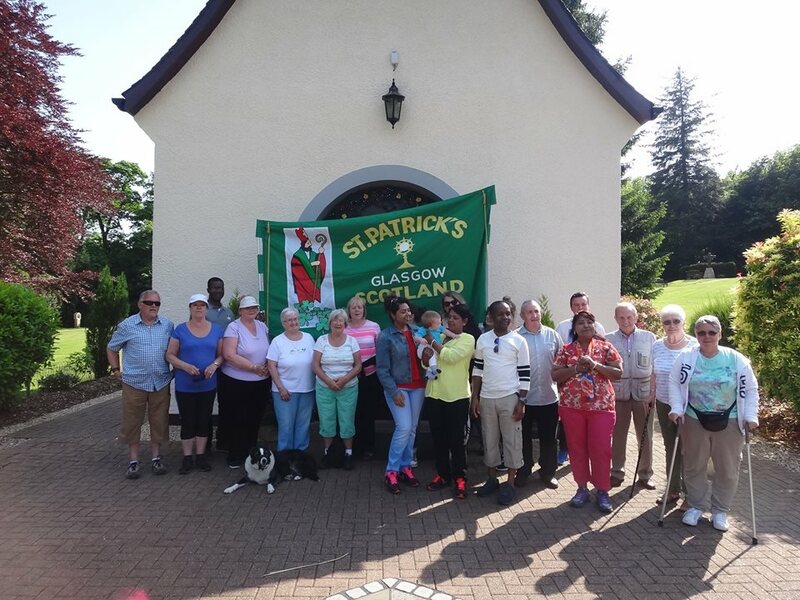 Parishioners of St Pats walked from Strathblane to Schoenstatt to raise money for parish funds and for the parish in the home town in Nigeria of the parish priest, Fr Francis Okereke. The ages of walkers ranged from below one year to 73 years old. Canon Hill’s departure for St Matthew’s, Bishopbriggs was marked at Mass on The Epiphany, 6th January 2013. Tommy Cavanagh, former Chair of the Parish Pastoral Council, addressed the congregation and thanked Canon Hill for his work for St Patrick’s since he took over responsibility for the parish after the devastating events of 2006. His Appreciation is reproduced below. I have been asked to say a few words of thanks and gratitude on behalf of the Parish Pastoral Council and parishioners of St Patrick’s on the occasion of the departure of Canon Robert Hill from us. The parish over many years has been fortunate to have had some memorable priests but few have come to us when we were somewhat battered and bruised by events and a daunting amount of repairs required to the structure of this magnificent church. Where to begin our thanks and appreciation? Your personality and good cheer were immediately in evidence and your positive attitude in looking forward to the future gave us all the incentive to get on with the job in hand – a RESTORATION PROGRAMME. Your idea of PROJECT ST PATRICK’S was greeted by all of the parishioners with enthusiasm and together with your hard work and effort and help from our friends in other parishes they raised funds from many and some varied and unusual quarters from the sale of slate to events, help from Historic Scotland and donations small and large. The first phase has been successfully completed with the new roof – to keep us wind and water tight! At least. This is an ongoing project and when completed will be something which Canon Hill can justly be very proud of. When you came to us, as one parishioner remarked, you raised our spirits and this was indeed true and very necessary at that time. We are a small parish in numbers but large in heart and we punch well above our weight – it is quality not quantity that is important, as you yourself have often remarked. Up until 2011 you had the responsibility of the parish of St Charles’ as well as St Patrick’s which was a heavy load for one priest and you were able to bring the two parishes together in pilgrimages, social and religious events. Your love of music and the liturgy of the Church have brought much enrichment to our services particularly at Easter and Christmas and your encouragement and involvement with the Royal Academy of Music and Drama has placed this church very much on the cultural map within the city. One of the main functions of our priesthood is to preach the Holy Gospel and bring the good news of Our Lord to his people. Well, Canon. As an expert in that field we have been very fortunate to have had you and something we will remember you by, you have enlightened us at every Mass to the meaning and interpretation of the good news!! - - some would say at some length!! But not me! Each and every group within the parish has benefited from your spiritual help, practical advice and humour from the success of the RCIA in bringing new members to the church, the children and teachers of our Primary School, the youth, the senior citizens, the sick and the beautiful Sacrament of Reconciliation and the great success of the Visit to Scotland of our Holy Father. By your hard work and spiritual support we are now a healthy and thriving parish and with God’s help, have every reason to look forward to the future and carry on the tasks in hand knowing that you have laid secure foundations for us. We wish you all the best and every blessing in your new parish of St Matthew’s, they are very fortunate to have you, but you have fresh fields and pastures new in you priesthood but a bit of your heart will always be here with us in St Patrick’s. A cheque was presented to Canon Hill in appreciation of his work for the parish. Clearly moved, our Parish Priest thanked the people of St Patrick’s for their support and friendship over the five and a half years of service. He left with a heavy heart but was sustained by the affection of the parishioners and the knowledge that they wished him well in his new ministry. Our new Archbishop Philip Tartaglia was the principal celebrant at a Mass to mark the 50th anniversary of the opening of the present St Patrick’s Primary School, built on the site of the previous building which burned down in 1957. 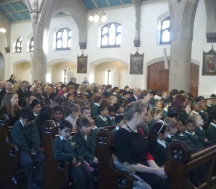 With the children in the congregation were parents, former pupils, civic leaders and teachers from both St Patrick’s and surrounding schools. The Archbishop spoke to the children most warmly and told them that he had been born in Anderston and baptised in St Patrick’s church. He pointed out that, although this was a celebration of the half-century of the current building, it was worth noting that it also marked almost two hundred years of Catholic education in Anderston. He congratulated the staff and commended them for their hard work in educating their pupils academically and spiritually, emphasising that Catholic education benefited not just the Catholic community but society in general. In closing he asked the girls and boys to look on him, Archbishop Philip, as their friend and as such to remember him in their prayers. Following the celebration of Mass, the congregation walked over to the school where there was a beautifully prepared buffet and an extensive exhibition of the school’s history which had been organised by staff and pupils. One of the exhibits quite amazed some of the youngsters – Barry McCartan’s belt! They could scarcely believe that pupils in the past (including Mr McCartan himself) had been subjected to such punishment. L to R: Former "janny" George Fitzpatrick and his wife; Pupils cut the celebratory cake; St Pat's Old Boy Fr McAlinden, the Archbishop, Susan O'Donnell and some of the children. singing a variety of songs to entertain an audience gathered in the Mitchell Library. They are pictured here during their performance which was greeted with applause. St Patrick's is blessed with an active and passionate parish council. To find out more about their activities and read the minutes of their meetings, please click on the photo. If you'd like to get involved with the Parish Council or support its work in some way, then please contact the Parish Priest. Our regular readers help to bring the Word of God to the congregation during Mass. Whilst our Eucharistic Ministers help to take the Host to the sick and elderly in the parish. Some of the younger members of our congregation serve as Altar Servers. You can check the relevant rota by clicking on the photo. If you would like to offer your services as a Reader , Eucharistic Minister or Altar Server, please contact the Parish Priest. St Patrick's has a very active parish life with worship, fundraising and pilgrimage opportunities. Click on the photo to check our calendar to see what events and services are coming up. 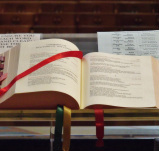 Our weekly bulletins provide a great overview of the life and worship of the parish. You can read the bulletins from the last month by clicking on the photo. The latest bulletin is always available on our home page too.